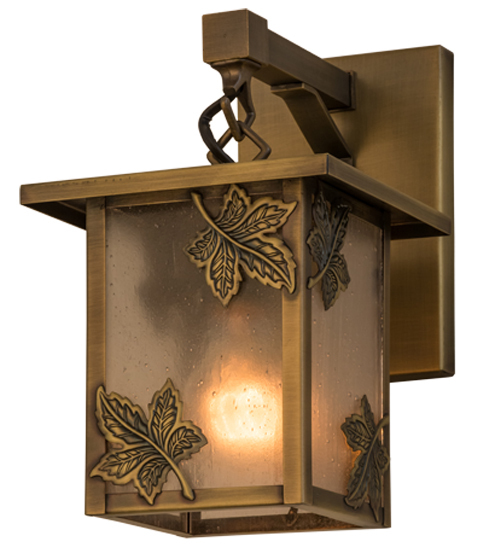 Description: Custom crafted of Solid Brass, this handsome lantern is designed with Clear Seeded glass featuring stunning Maple Leaf accents with matching hardware finished in Antique Brass. One of America's favorite shade and ornamental trees, Maples provide richest colors and represent a loving spirit that sharpen our intuition and strengthen our creativity and health. Perfect for indoor and outdoor applications, the Craftsman Signature fixture is handmade by Meyda artisans in the USA, at the foothills of the Adirondack Mountains. Custom sizes, styles, colors and dimmable energy efficient lamping options are available. Description: Custom crafted of Solid Brass, this handsome lanternis designed with Clear Seeded glass featuring stunningMaple Leaf accents with matching hardware finished inAntique Brass. One of America's favorite shade andornamental trees, Maples provide richest colors andrepresent a loving spirit that sharpen our intuitionand strengthen our creativity and health. Perfect forindoor and outdoor applications, the CraftsmanSignature fixture is handmade by Meyda artisans in theUSA, at the foothills of the Adirondack Mountains.Custom sizes, styles, colors and dimmable energyefficient lamping options are available.